...the Flood Warning Continues For The Following Areas In Texas... Elm Fork Trinity River Near Carrollton Affecting Dallas County East Fork Trinity River At Mckinney Affecting Collin County Trinity River At Trinidad Affecting Henderson And Navarro Counties The Flood Warning Continues For The Trinity River At Trinidad. ...Read More. ...the Flood Warning Continues For The Following Areas In Texas... Elm Fork Trinity River Near Carrollton Affecting Dallas County East Fork Trinity River At Mckinney Affecting Collin County Trinity River At Trinidad Affecting Henderson And Navarro Counties The Flood Warning Continues For The East Fork Trinity River At Mckinney. ...Read More. ...the National Weather Service In Fort Worth Has Issued A Flood Warning For The Following Areas In Texas... East Fork Trinity River Near Crandall Affecting Kaufman County Chambers Creek Near Rice Affecting Navarro County Trinity River Near Rosser Affecting Ellis And Kaufman Counties The National Weather Service In Fort Worth Has Issued A ...Read More. ...the National Weather Service In San Angelo Has Issued A Flood Warning For The Following Rivers In Texas... Colorado River Near Ballinger Affecting Runnels County The River Is Expected To Rise To Minor Flood Stage Due To The 4 To 5 Inches Of Rain That Fell Within The Basin. Most Of The Rain Fell In The Far Upper Basin, So It May Take A While To Get To The Gage. ...Read More. ...the Flood Warning Continues For The Following Areas In Texas... White Rock Creek Near White Rock Creek At Greenville Ave Affecting Dallas County The Flood Warning Continues For The White Rock Creek Near White Rock Creek At Greenville Ave. * At 0715 Am Wednesday The Stage Was 85.79 Feet. ...Read More. ELKHART – Version 2.0 may prove a bit more successful than the first go round, at least if Rosemary Biel has anything to do with it. The agency replaced the Keep Elkhart Beautiful Commission run by the city council. The first meeting of the new KEB was held Nov. 12, 2015 and by Jan. 2016, Biel said, there was a full board in place. Seven members and the officers were elected and the first mission was completed and deemed a success. KEB, Inc installed two small litter collection points in the town. A local business owner lent space for waste disposal and the agency earned its first $2.60 in recycled cans. It was a small start, but everything is up and running and plans are in place for further, bigger beautification projects. Biel’s determination is obvious and she has taken charge, by request of the board, of the new 501c3 program in the city. Part of that process was requesting the non-profit status. It is really a difficult job. There is no easy way to deal with the federal government, but so far, Biel explained, everyone she’s spoken with has been very nice. “The first action was to submit to the Secretary of State a Certificate of Formation. It had been received by February and confirmed to the application provisions of the law. “Then we applied and received our EIN number from the IRS. KEB, Inc opened a bank account with CBTx Bank of Texas. It took four months to have the time, knowledge and energy to submit a proper request to the IRS for approval of a 501(c) (3) tax exempt status. It took three calls one week and one day the next for me to get the person I needed,” Biel gave a brief outline. “We delightedly received our letter in Aug. 2016,” she said. Biel has several years experience in setting up and maintaining non-profit organizations such as KEB, making her the natural choice for the effort locally. She set up a Cultural and Art agencies in Minnesota and South Dakota. She is an avid theater patron who fully supports those efforts – yes, with an agency she started. Biel spearheaded the Citizens for Big Stone Lake non-profit, still up and running in the north. Closer to home, she has worked with the Anderson County Concert Association. 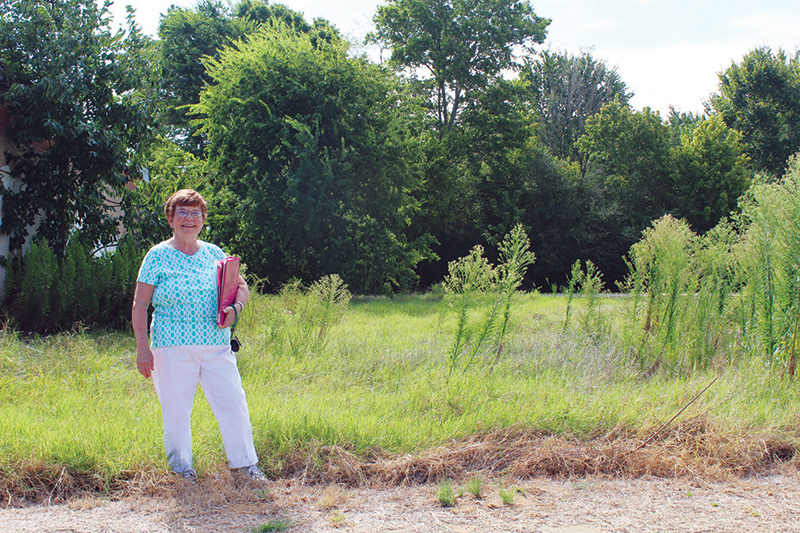 That association only lasted two years, thanks to the poor economy at the time, but Biel is still on the Anderson County Arts Council, where she now serves as treasurer after several years as president. Biel works closely with the Texas Democratic Women’s club, and said groups such as those really help a lot with the smaller municipalities efforts to self-improve. Self-improvement is a matter of bringing several facets together. Aesthetically pleasing places to live directly reflect on the mood and morale of a city, she explained. Further, good economic strategies involve having a city into which residents and businesses want to relocate, and that takes work. There is a nice little lot right downtown in Elkhart, across from city hall. The lot could use some TLC and Biel, the board and the volunteers have just the ticket. “I have someone who worked in the business of trash and clean up, and he said a clean city is a major part of what brings people in to the area or town,” she said. In order to best serve the city, Biel explained, “I need to know what the citizens want.” To attain that end, there will be an Open House on Sept. 10 from 10 a.m. until 2 p.m.
“The event will be at the First United Methodist Church on Parker Street across from the Elkhart Elementary School. We welcome the public. We are reaching out to the public with membership and volunteer applications. “The president is visiting a number of churches to seek the people who want to help Elkhart and our part of the earth. It is exciting and there will be hours of work for the board. “We have applied for one grant so far,” Biel said. Four hundred non-profits applied for the same grant of Snapple through Dr. Pepper. Only 51 grants were awarded. We can reapply next year and then purchase containers at a dramatically reduced price if we do not get the grant. It is all day by day and step by step for KEB, Inc to succeed,” she said. “We need you,” Biel entreated. “Volunteers and people concerned with their communities make the effort work. “You don’t have to wait until the Sept. Open House to inquire about our projects or volunteering or donating. We gratefully accept all donations, too,” she said. Biel can also be reached through city hall. Next articleNo ‘Big Brother’ for Palestine?